What is storm film? It is premium window film – such as the 3M™ Ultra Series of Safety and Security Window Film – that can help to protect your home and those in it during severe storms and hurricanes. Storm film by 3M™ delivers stronger performance than standard polyester films in blast and impact events, yet still maintains a high level of optical clarity. That makes this type of film perfect for businesses as well. Now is the ideal time to install storm film to be ready for the 2018 Atlantic hurricane season before it starts on June 1. It’s important to be prepared, even though we hope it’s a milder season than last year, which has been called the busiest and most destructive hurricane season on record. Storm film adds extra layers of adhesive and film to windows, which makes them stronger and harder to break. If they do crack or break in a severe storm or hurricane, the film helps to hold them intact. 3M™ Impact Protection Attachment Systems provide additional security by anchoring the film to the glass frame. Storm films help to protect people from flying glass shards, one of the most common causes of injuries and fatalities in storms. The 3M™ Ultra Series of Safety and Security Window Film, for example, is micro-layered, tear-resistant and applied with a thick adhesive so it helps to hold glass fragments together even if a window cracks or breaks. It’s been tested at wind speeds up to 170 mph. This reduces the risk of injury from flying shards of glass. 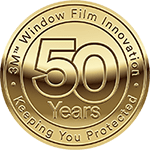 Since storm film holds windows together, even if the windows crack or shatter, water and debris caused by storms is kept out of homes and businesses. In a published 3M™ case study, a Florida couple reported that while many of their neighbors’ homes were condemned to water damage following a hurricane, their home had no water damage. They had protected their windows with storm film from 3M™, and when they’d returned to their home after being evacuated, they had only one cracked window. Additionally, the single fractured window had remained intact due to the film, keeping water and debris from the storm out. Carolina Solar Security is a premium 3M™ Authorized Window Film Dealer in Wilmington, NC. We have been providing Southeastern North Carolina with window tinting solutions like storm film since 1985 and never stop working to bring our customers the best products paired with the most skilled window film technicians. Reach out to us for your free quote today!